Motherwell are promoting Alan Burrows to general manager to replace departing chief executive Leeann Dempster. With Dempster leaving to take up a similar role at Premiership rivals Hibernian, Burrows will step up from his media relations duties. Burrows has been working at Fir Park for six years and will take on his new post from 1 June. "Needless to say, it is a huge honour for me to be asked by the board to take up this role," said Burrows. 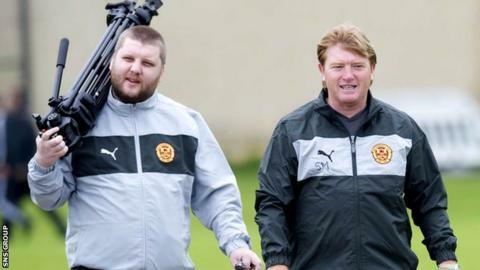 Talking to the Lanarkshire club's website, he added: "I have been a full-time member of staff at Fir Park since September 2007 and have enjoyed some really fantastic times. "For the majority of that period, I have worked closely with Leeann, I have a good understanding of the club and its needs, whilst working hard to improve my own department at the club. "Whilst my aim is to keep that continuity, I also have fresh ideas that I feel can help improve not only the club but the experience for supporters too."